This summer I'm making it my mission to be more mindful of the sun and its damaging effects. I went on a hunt for what I call the best Summer Glow Trio: An organic sunscreen to protect, a non-toxic self tanner to keep glowing and finally an Aloe Vera that wasn't dyed blue or green (for absolutely no reason), to replenish my skin after long summer days. It seemed like a lot to ask but I was more than pleasantly surprised by what I found. 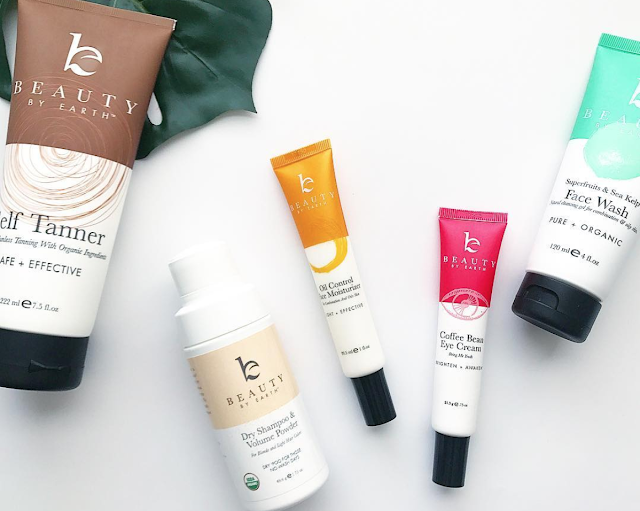 Beauty By Earth was founded in 2014 when two friends who were sick of putting harmful junk on their bodies, put their heads together to make safer, affordable and more easily-accessible products for everyone. Every product that Beauty By Earth makes is non-toxic, all natural and organic. They use NO parabens, chemical fragrances, phthalates, alcohol, soy, corn, gluten, petroleum, or any other fillers for that matter and almost everything is totally vegan. Beauty By Earth is a cruelty-free brand and everything is made right here in America. 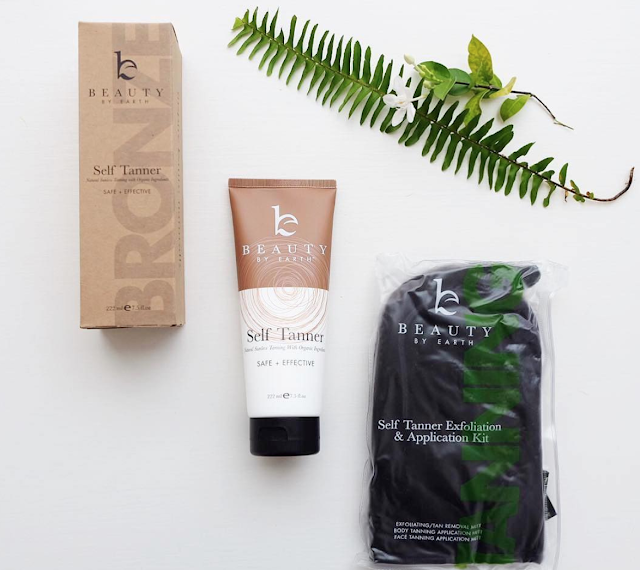 The natural, organic self-tanner bundle from Beauty By Earth. Includes the in-shower exfoliator mitt, the vevlety body applicator mitt and the mini face applicator mitt plus clear carry pouch. In California, the sun shines its brightest almost every day. I was so thrilled to finally find a natural sunscreen that is safe for my body and ocean life. This 25 SPF facial and body sunscreen uses non-nano minerals to protect from the harsh sun, creating a barrier on top of your skin instead of sinking into it. It uses natural ingredients thats won't harm local eco-systems, coral reefs, or any other marine life. It's also water resistant and biodegradable. The self tanner bundle is my newest, and most likely life-long, addiction. The shower exfoliator glove and tanning mitt bundle made the whole experience that much easier. The exfoliator glove really sloughed off my gross, dead skin, the velvet mitt made it easy to apply the lotion evenly and I didn't have to wash my hands to death afterward to avoid orangey fingers and wrists.The self tanner formula itself has a lovely light vanilla scent. I was noticeably two shades darker in a few hours and it lasted a solid week. 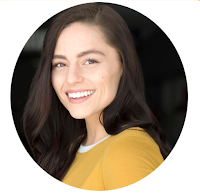 Click here for the bundle I used and loved. Beauty By Earth's SPF 25 mineral Facial Sunscreen- also comes in larger bottle for your whole body. The Aloe has a great consistency and soothes the skin immediately. The formula also has small amounts of Vitamin C, Vitamin E, Radish Root Ferment Filtrate, and Sodium Citrate to give your skin some extra love. Keep the bottle in the fridge for an even cooler soothing sensation when you need it most! 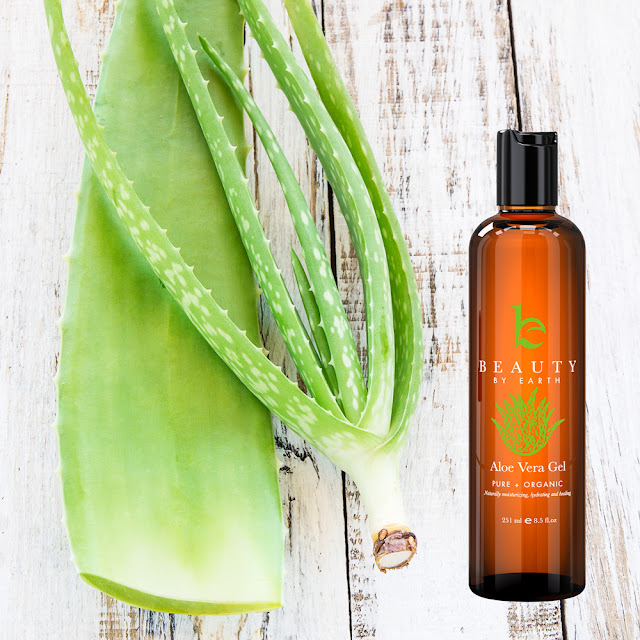 Organic aloe also has a variety of unique natural properties for use as a disinfectant, antimicrobial, antibacterial, antiseptic, anti-fungal, and anti-viral properties, so it's a perfect addition to your first aid kit. Finally, something I really adore- every product Beauty By Earth sells comes with a 30 day, 100% Customer Satisfaction Guarantee. If at any point over the next month you don’t love your product, just send it back and they'll give you a full refund – no awkward questions asked.